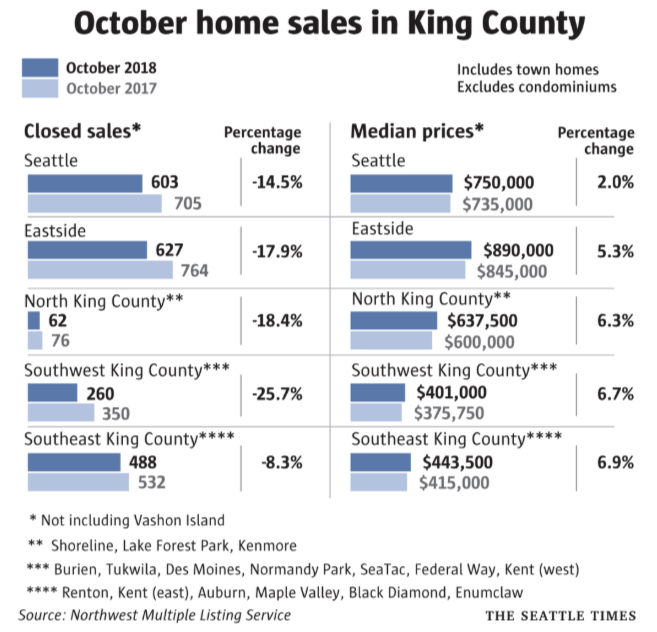 Seven years of Seattle home prices outpacing wage growth because of low rates; bidding wars replaced by sales at the asking price; days or weeks on the market turning into months; sellers reduce home prices; surging mortgage rates; buyers disappear, and wallah- a classic turning point in an auction, otherwise known as an unfair high that is now rippling through the real estate food chain in the Seattle area. 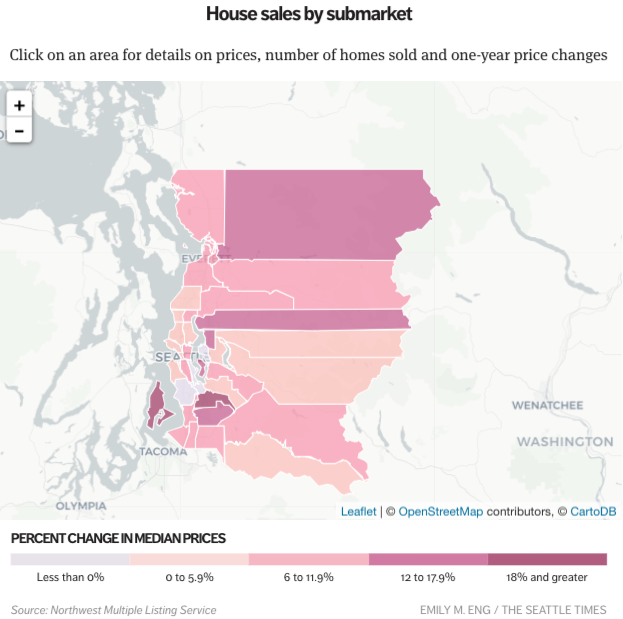 As a reminder, before we dive into the faltering real estate market in Seattle. Back in September, we outlined a significant clue about the overall health of America's housing industry: Bank of Ameria called it: "The Peak In-Home Sales Has Been Reached; Housing No Longer A Tailwind." He warned, "that is not a normal seasonal drop -- prices in the city actually went up during those time frames last year." Rising interest rates, declining demand, and flat-lining rents have been the main drivers of failing homebuyer demand in the second half of 2018. Ken Graff, a broker with Coldwell Banker Bain in Seattle, listed a townhouse in Magnolia on the market in April, "right before the apparent peak of the market," and had 11 bidders who ferociously fought for the home, with a winning bid for $800,000. In September, he listed an identical townhome in the same neighborhood, it stood on the market for three weeks before selling for $725,000. The slowdown in Seattle housing shows little signs of abating as the Federal Reserve is expected to hold rates on Thursday before a hike in December. At their most recent meeting in late September, Fed officials communicated a plan for three more hikes in 2019. 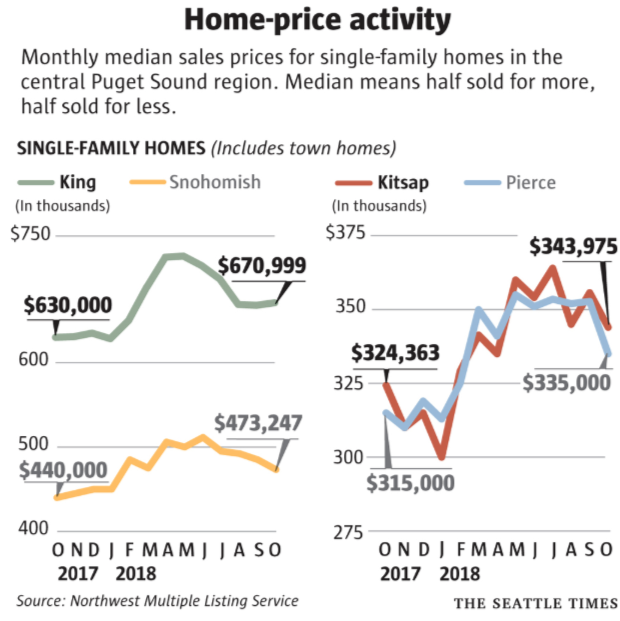 With one more rate hike forecasted in 2018 and three more in 2019, it seems that Seattle and much of the country's real estate market could be at a significant turning point into the 2020 presidential elections. Let us hope real estate prices do not fall even further, as many homebuyers could vote with their home prices.